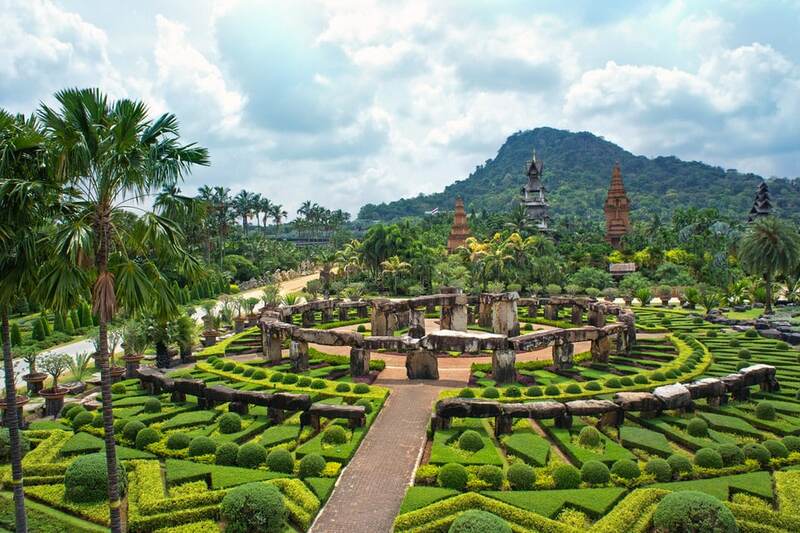 Nong Nooch Tropical Botanical Garden has been one of the top tourist attractions in Pattaya for many years. Its large selection of gardens, activities, and performances can fill an entire day trip, if not several days’ worth of exploring the grounds. 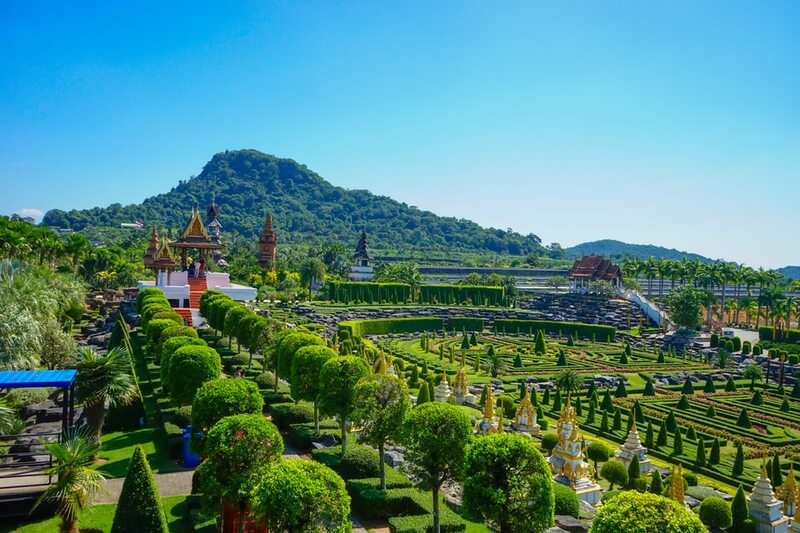 The grounds are expansive and it would be tough to see all the top sights on foot, much less all of the 600 acres of plants and gardens available to visitors of Nong Nooch. Guests are able to explore the botanical gardens at their leisure, on foot, on rental bike, or on the sightseeing bus that departs every half hour. There are plenty of photo opportunities throughout the gardens showing plants and designs from across the world. 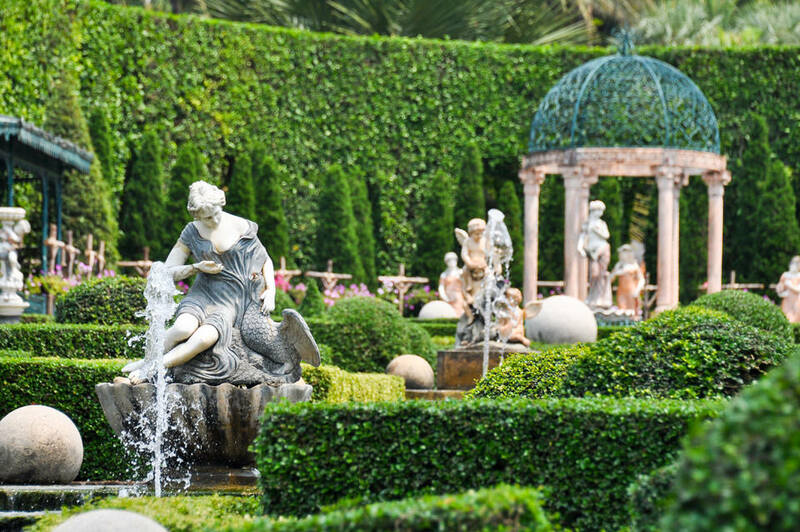 You’ll enjoy gardens ranging from traditional French and Italian designs to unique collections of bonsai and agave. 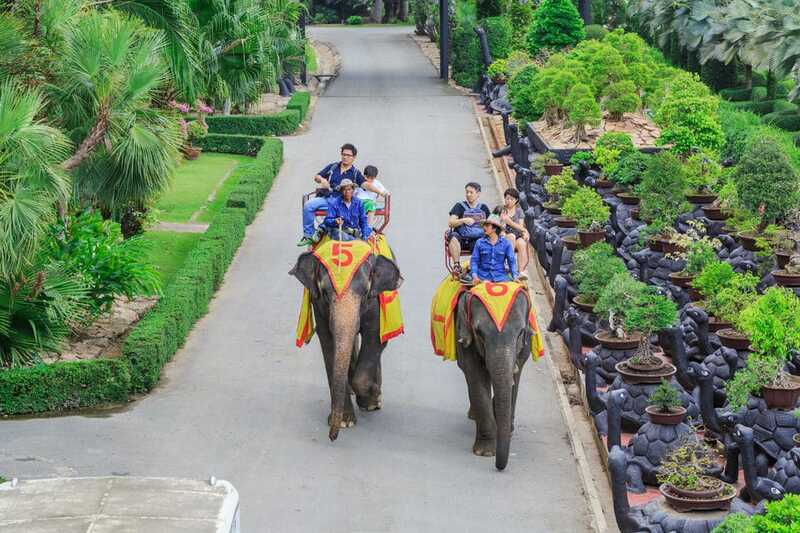 In addition to exploring the gardens, Nong Nooch has a variety of activities and performances to entertain visitors throughout the day including the Skywalk, elephant riding, and cultural shows. It is a great way to spend a day while in Pattaya. The 600 acres of land that now holds the Nong Nooch Tropical Botanical Garden and resort was purchased in 1954 by Pisit and Nongnooch Tansacha. It was originally slated to be a fruit orchard, growing oranges, mangos, and coconuts. However, after traveling the world and discovering his love for gardens and flowers, Mr. Tansacha decided to turn the land into a botanical garden that visitors could come to and enjoy. He built out the property with restaurant, resort, and other facilities. 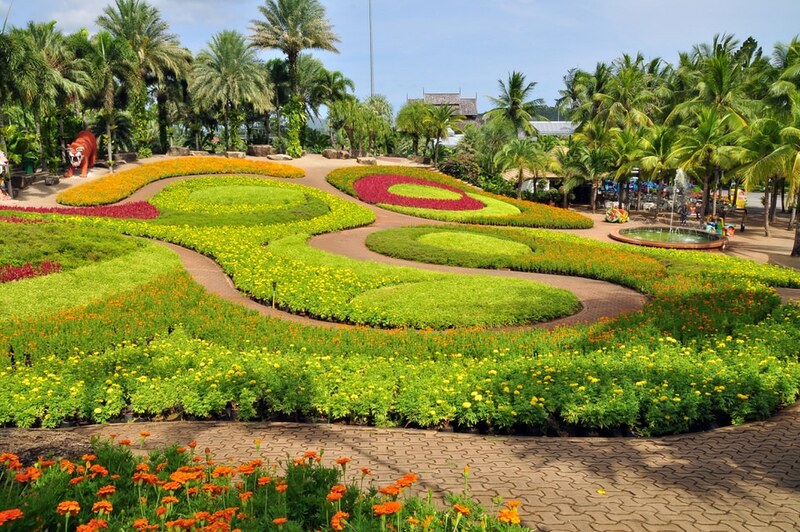 The park opened in 1980 and has continued to expand and grow to be one of the biggest botanical gardens in Asia and one of the most popular tourist attractions in Pattaya. Nong Nooch is also dedicated to education and preservation of the cycad and other rare and endangered palm trees. It has been internationally recognized for its conservation efforts. The gardens have reached such renowned status that a rare vine with golden flowers originating in Thailand is commonly called the Nong Nooch Vine after the park. The Petraeovitex bambusitrum. 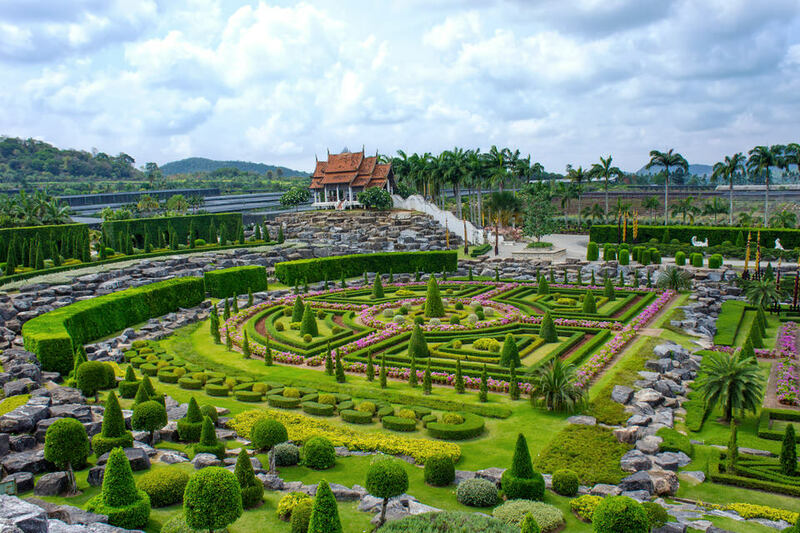 Most people come to Nong Nooch to explore the amazing gardens, full of plants and flowers from around the world. There are over 20 separate types of gardens, each designed to display the different plant life. Inspired by the gardens at the Palace of Versailles in France, this garden is 10 acres covered in beautiful flowers and mesmerizing geometric designs. This garden is designed to look like something that would not be out of place in old world Italy. Flowers, shrubs, fountains, and water features are the focus of this space. Centered around a Stonehenge with circles of shrubs, flowers, and rocks, this garden was inspired by the original Stonehenge in England. A beautiful display of flowers planted on a small hill, designed to look like butterfly wings. There is a small winding path through the bed of flowers so you can enjoy the beauty and fragrance of the flower garden. 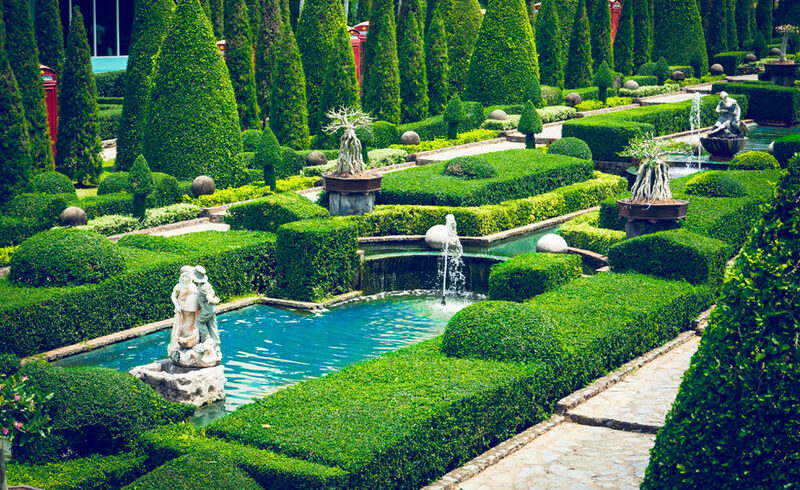 This is a traditional European style garden with well-crafted hedge rows and winding paths. Dozens of fake animals like foxes and turkeys are place throughout the garden. OK. This is not really a garden, even though they list it as one. 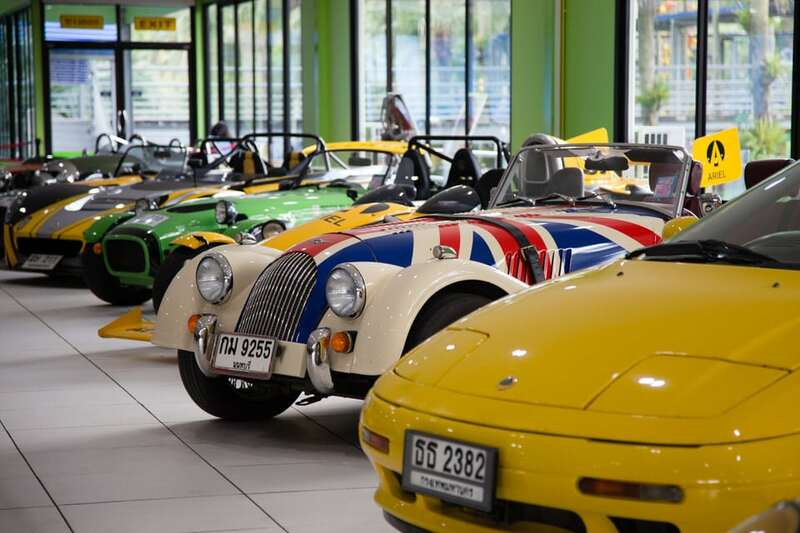 What you’ll find here is a gallery of rare sports cars on display. Still pretty cool and worth a look if you like cars. Outside of the gardens, there are other activities on offer at Nong Nooch Tropical Gardens. Other than the Skywalk and bike rental, which are good, you can probably give the others a pass and not feel you missed out on anything. A 3 Km elevated walkway that gives you some stunning views of the park. Rent a bike and take a ride around the park. This is a great way to see the park and get a little exercise. You can pay to ride and elephant around the park. This is not elephant jungle trekking, and designed for tourists who want to say they rode an elephant. If this is you, it may be worth the money…maybe. Rent a paddle boat shaped like a swan and cruise around the lake for a little while. Arapaima are large fresh water fish from Brazil and Nong Nooch has 60 of them swimming around in a pond. They will let you feed them for a small price. There are two shows that are definitely worth seeing and part of the experience of going to Nong Nooch Botanical Gardens. They are included in the ticket price. The Thai Cultural Show and Elephant show. Both are performed several times throughout the day so you will have plenty of chances to see them. 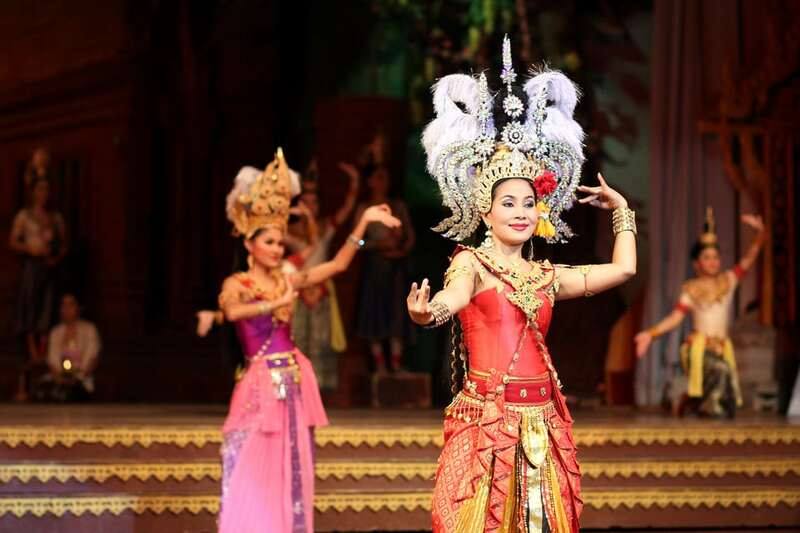 This performance displays various aspects of Thai Culture and history. Costumed performances, dance routines, and martial arts displays are the hallmarks of the show. It is very entertaining and enjoyable. The show takes place in the onsite theater. 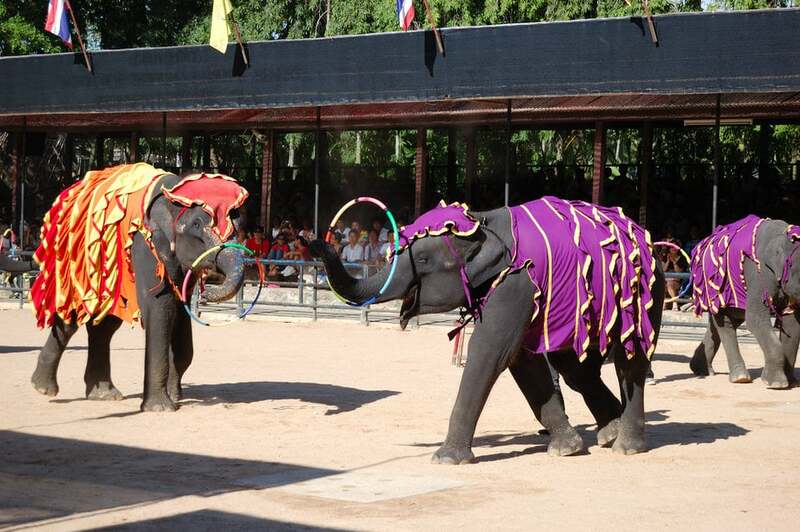 The Elephant Show at Nong Nooch also takes place several times a day and is quite entertaining. It shows of the talents of the parks trained elephants in a variety of fun ways. Watch them ride a three wheeled motorcycle, paint a t-shirt, shoot a basketball, and do a variety of other tricks. These are the current show times at the time of this writing. Please check with the park for current hours on the day you are visiting. Each show is an hour long. If you get hungry there are a couple options. You can eat at one of the restaurants inside the resort. The Vivat food court which offers both Western and Thai food. It is the economical option. There is also an Indian restaurant and a sit down buffet style restaurant onsite as well. If you would like to stay inside the park, there are several different options for accommodation at Nong Nooch. Inside the gardens is the Nong Nooch Resort and Lakeside Villa. The hotels are equipped with a full set of facilities including swimming pool, fitness center, coffee shop, and convenience store. There is also a full service Spa available as well. For business there are several meeting halls that can accommodate from 50 to 400 people. You can book through a tour operator if you wish to include transportation, those prices will vary. Image Credits: Olga Vasilyeva/Shutterstock.com, Tikhaia Nadezhda/Shutterstock.com, Anotai Yuthongcome/Shutterstock.com, jack_photo/Shutterstock.com, Dimos/Shutterstock.com, slava296/Shutterstock.com.